Arthur George Gaston, wealthy businessman and civil rights activist, was born on July 4, 1892 in Demopolis, Alabama to Tom and Rosa McDonald Gaston. He was raised by his former slave grandparents Joseph and Idella Gaston. In 1905 Arthur Gaston moved to Birmingham where he attended the Tuggle Institute for black children. In 1910 he joined the army and during World War I served overseas in France. After his honorable discharge from the military, Gaston worked for Tennessee Coal and Iron Company in Fairfield, Alabama. While employed at the mine, Gaston became an entrepreneur, selling meals and affordable burial insurance to the black community. In the late 1930s he opened an insurance company and funeral home across from Kelly Ingram Park in downtown Birmingham. As his insurance business grew, he diversified his financial services by opening the state’s only black owned savings and loan in the early 1950s. His business also sponsored black cultural events and even formed a black quartet that performed on the nation’s first African American radio program. 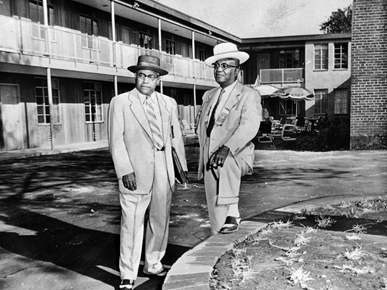 In 1954 Gaston opened A.G. Gaston Motel near his other businesses to welcome black visitors turned away from hotels that practiced Jim Crow segregation. Before the close of the decade he employed the largest number of African Americans in the state and he had become one of the wealthiest African Americans in the United States. During the early years of the modern civil rights movement, Gaston effectively maneuvered quietly behind the scenes to support civil rights activists. He offered to donate money to the legal team of Autherine Lucy, an African American who in 1955 had filed a lawsuit to integrate the graduate school at the University of Alabama. He also gave financial assistance to Tuskegee activists forced out of their homes because they challenged voting discrimination. In 1956 when Birmingham civil rights activist Reverend Fred Shuttlesworth founded the Alabama Christian Movement for Human Rights, the organization held its initial meeting at Gaston’s downtown office. Gaston also allowed activists to lodge at his hotel and meet there to plan campaigns. During the 1963 Birmingham demonstrations at Kelly Ingram Park, Gaston used his financial resources to bail out of jail Martin Luther King, Jr. and other incarcerated activists. When Gaston died at age 103 on January 19, 1996, he had left behind the Booker T. Washington Insurance Company, the A.G. Gaston Construction Company, the A.G. Gaston Boys and Girls Club, and CFS Bancshares, the nation’s second largest black owned bank. A. G. Gaston, Green Power: The Successful Way of A. G. Gaston (Birmingham: Southern University Press, 1968); Carol Jenkins and Elizabeth Gardner Hines, Black Titan, A.G. Gaston and the Making of a Black American Millionaire (New York: One World/Ballantine, 2003).